Now five Penn State players have two fouls. Stevens joins the club. #PSUMBB timeout with 32.5 to play in the half, down three, 36-33. 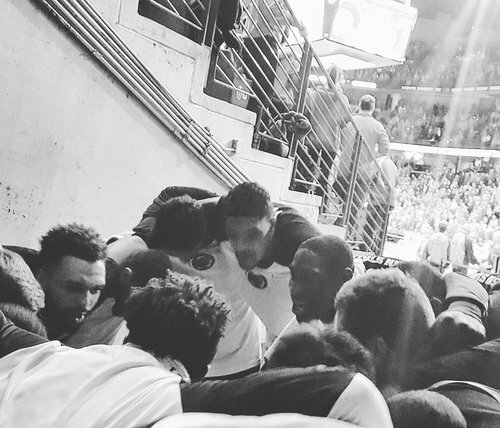 Penn State came in shooting 32.3% from 3 in B1G play. Hitting 6-10 tonight. #Badgers up, 36-33. Penn State plays great defense for 29 seconds and then Koenig hits a long 2. What do you do? #Badgers up 36-33. Goodness that jumper is silky. BK beats the shot clock for the #Badgers and he's into double figures with 10ptps. BK beats the shot clock for the #Badgers and he's into double figures with 10pts. PSU will hit a 3. Halftime: #Badgers 36, Penn State 33. Koenig with 10 to lead all scorers. 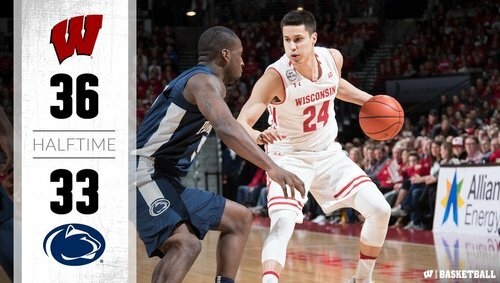 HALFTIME: No.15 Wisconsin 36, Penn State 33. UW shoots 39.3%, its third straight first half shooting under 42% from the floor. #Badgers flirting with danger if PSU can keep shooting. Nittany Lions down 3 at half but confident. No fear there. FIRST HALF SCORING: Koenig 10, Hayes 8, Happ 7, Brown 7, Showalter 2, Illikainen 2. PPP: #Badgers 1.09, Penn State 1.0. UW shot 39.3 percent overall, 33.3 percent from 3-point range, 62.5 percent from FT line (10 of 16). #Badgers built a 10-point lead in first 6 1/2 of game. Guessing Gard is lighting a fire in the locker room now. So No. 2 Kansas went down at W. Virginia and MU has No. 1 Nova on the ropes late. Second half set to begin. Two quick baskets by Happ, who has 11 points, and the #Badgers are up 40-33. Pat Chambers quickly calls a full timeout after UW scores 4 pts on its first two possessions. 40-33 UW. #Badgers Happ, 2 of 6 in the first half, 2-2 in the first 1:01 of second half and UW lead is 40-33. Happ up to 11 points after another score down low. Two quick buckets by the #Badgers to open the second half. Happ has 11pts and Koenig has 10. #PSUMBB takes a quick timeout after Badgers jump out 4-0 to start second half. UW leads 40-33. No. 1 Nova, by the way, had a 15-point halftime lead over MU. #Badgers open up a 10pt lead! Wisconsin has opened the second half on a 10-2 run and Happ is at the line trying to extend the lead. Wisconsin started the second half on a 13-2 run. Happ with 7 of the points. #Badgers have a 52-38 lead. UW 3-5 from 3 and 6-8 overall. PSU 1-2 and 2-7. The #Badgers have outscored Penn State 16-5 this half and lead 52-38 with 15:26 remaining. Happ with 14, Koenig 13 and Brown 10. Hayes also playing well: 8 points, 6 rebounds, 3 assists. U16 (15:26): No. 15 Wisconsin comes out of the half on 16-5 run, 52-38. Tony Carr leads #PSUMBB w/ 11 points. Wisconsin has hit 5 of its last 6 FGs and has opened up a lead on Penn State. Happ has 14 for the #Badgers ; BK 13. #Badgers fans mostly applauding the Marquette win over Villanova. This is not a joke. The Marquette score gets big cheers here at the Kohl Center. #Badgers Happ had 7 pts in 16 minutes in first half. He had 7 pts (3-3 shooting) in first 3:35 of this half.